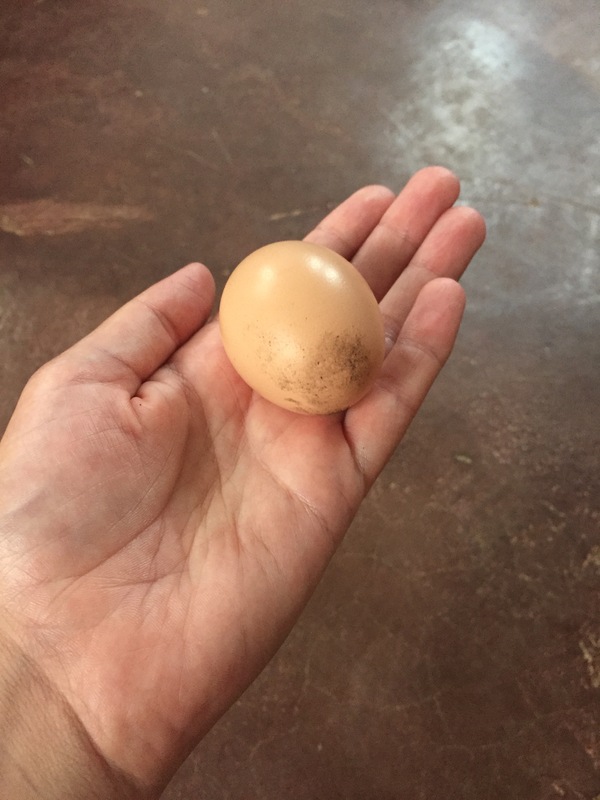 Having two living things partly under my responsibility (Make loves them as her own) has meant that I have paid attention to the antics of all the chickens more that I had before. They are surprisingly entertaining. 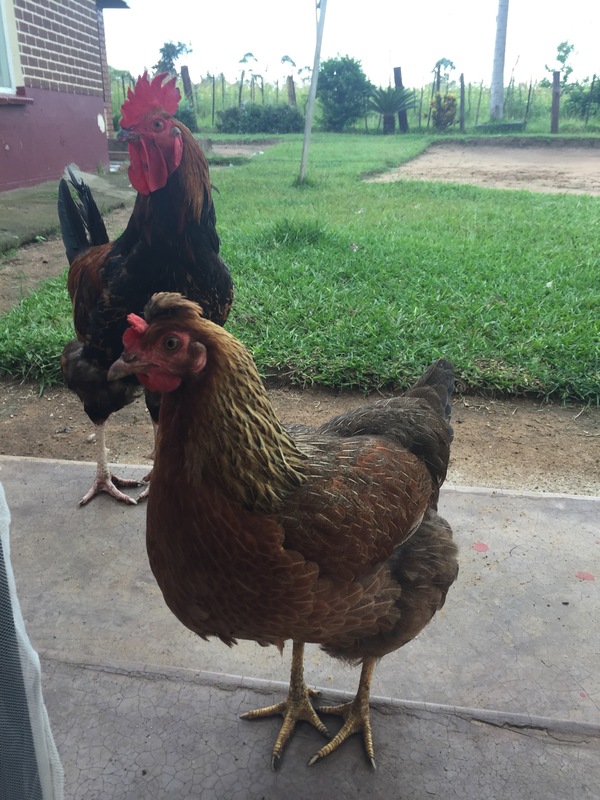 I love watching them run for food or when my chickens would run after me. Sometimes they would hang out at my screen door just waiting around. Any time Thandi or Sitfwatfwa would come visit, I would feed them. Thandi is definitely the dominant female of the two, and she shoves Siftwatfwa out of the way to get the food that she wants. I spent many hours standing on my veranda with my broom shooing away the other chickens so that mine could eat. The chickens only listen to Make and the rooster. Sitfwatfwa has this really funny way of eating. 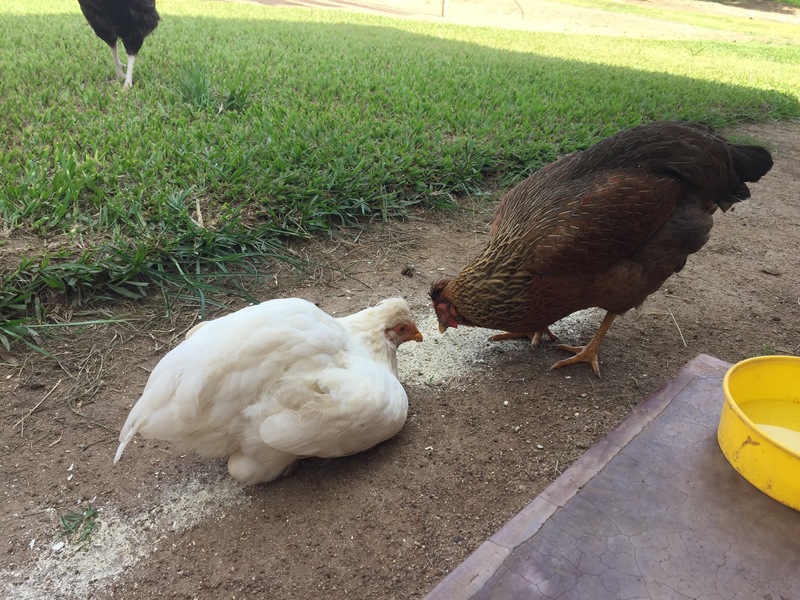 Neither of them had other friends in the flock until they started mating with the rooster. I think this forced their acceptance in the flock. The main rooster (we have three) still scares me. He makes strange noises, comes by for food without either of my chickens, and has talons and a sharp beak. A rooster attack is not high on my list, so I usually feed him when he’s around to keep him happy. Thandi started laying eggs at the end of February and Sitfwatfwa finally started in April. Thandi hides her eggs when she lays them around 10:30 a.m. and then she does a big and loud dance announcing the laying of the egg. Sitfwatfwa is much less crazy, as Make would say, because she lays her eggs in the appropriate spot at 2 p.m. and does not make a big fuss about it. Every night the chickens go to sleep in one of the mango trees. This surprised me until I read a few chicken-rearing guides that said trees are chickens’ favorite place to roost. This should not have surprised me because chickens are birds and birds sleep in trees. The mango chicken apartment tree with Sitfwatfwa getting cozy with the rooster. One of my bosisi explained the tree as an apartment building with different branches as different rooms. The chickens might have a roommate, but they usually return to the same room/branch every night for sleep. 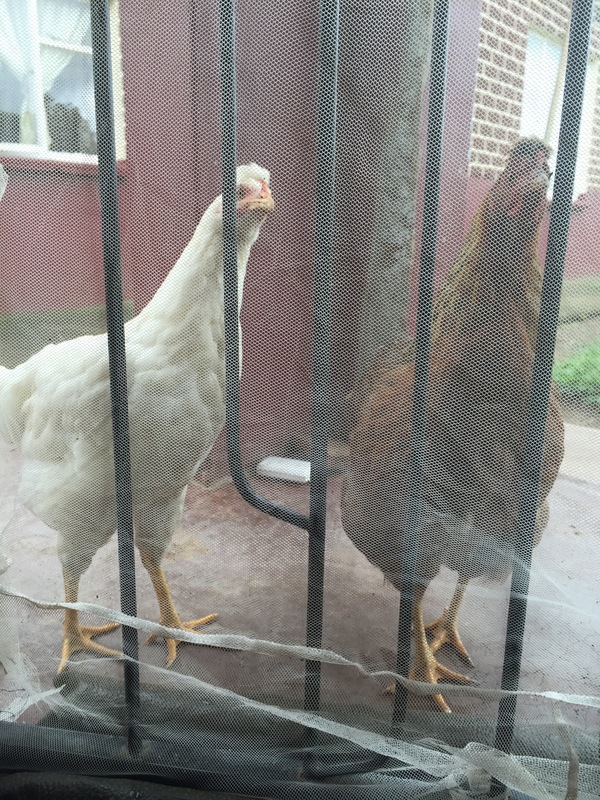 My chickens follow me around everywhere, love them! There is a tree that grows beside our chicken coop and run and there are branches on both sides so in the day they hang out in the branches on the outside of their fence and in the evening they hang out on the branches on the inside. However at night they go in to the coop to roost where they each have their own roosting spot with their buddy or buddies. I love how high up in your tree your chickens are! Every once in a while one of the chicken falls from the tree with a large squawk. I think it’s usually over a branch dispute.